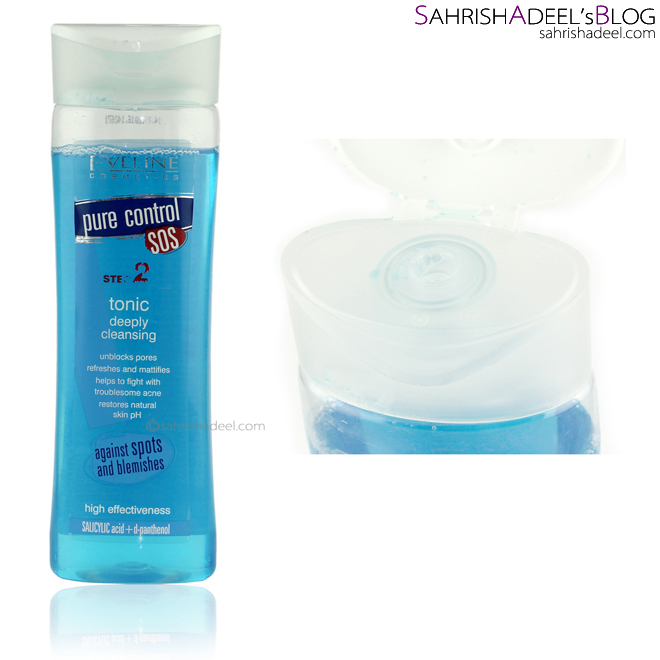 Pure Control SOS Range by Eveline Cosmetics - Combined Reviews | Sahrish Adeel - Malaysia based Pakistani Beauty & Lifestyle Blogger! I don't always get confused about certain products but when I do, I use them until I have no more doubts about them. Today I have Eveline Cosmetics' Pure Control SOS range for you. Let's see if all the claims they make are true. Let's talk about each product one by one. This everyday routine has three products with three steps mentioned on each bottle / tube. I will also be including the claims the company itself makes about these products along with my personal experience. I have used these products for enough time to reach to a conclusion. FACE WASH GEL CLEANSING AND REFRESHING against blackheads and imperfections • perfectly purifies • reduces skin shine • does not dehydrate the skin delicate formula! immediate REFRESHMENT effect hamamelis + GRAPE SEED extract + vitamin E MAINTAINS HEALTHY LOOK OF THE COMPLEXION Pure Control SOS cleansing and refreshing face wash gel, thanks to hamamelis virginiana extract content perfectly cares acne-prone skin. Prevents creation of blackheads and regulates sebum secretion. Gel perfectly purifies the skin, prevents blemishes creation. Contained grape seed extract and vitamin E moisturize, nourish the skin, quicken the process of its regeneration. Mint leaves extract refreshes and soothes the skin. This product comes in a plastic bottle with a pump mechanism. Each pump brings out the quantity which is enough for one time use. The product is green in color with a liquid-gel like consistency. It makes leather upon contact with water. It has a very mild but nice scent but has a bit of bitter taste. Each bottle contains 200ml of product. This face wash gel really purifies the skin and leave is squeaky clean. I love how it removes everyday makeup too. My skin is super oily and it goes matte after the wash but I clearly feel my skin getting tighter in not a very nice way. After every wash, I also feel a soothing effect on my skin. Please read the final conclusion at the end for some important details that I will be mentioning about this whole skin care routine. It costs pkr 395. In Pakistan, you can buy Eveline Cosmetics online from just4girls.pk & darak.pk and from these stores: Karachi - Naheed Super Market Bahadurabad & Shaz Store Behind National Stadium Emis Khada Market. Lahore - Enem & Raja Sahib. TONIC DEEPLY CLEANSING against spots and blemishes • unblocks pores • refreshes and mattifies • helps to fight with troublesome acne • restores natural skin pH high effectiveness SALICYLIC acid + d-panthenol RESTORES HEALTHY LOOK TO THE COMPLEXION Pure Control SOS deeply cleansing tonic combines the unique salicylic acid and soothing d-panthenol. Regulates the secretion of sebum and perfectly fights with spots and inflamed blemishes. Thanks to the delicate peeling properties of salicylic acid, the tonic effectively eliminates blackheads, prevents the appearance of new ones, helps to fight with blemishes, leaving the skin fresh and matt. Visible results: reduced number of spots and infla-med lesions less blackheads and blemishes noticeable reduction of irritations. This product comes in a plastic bottle with a lid mechanism and you just pore the product on your cotton ball / pad and apply on the washed / cleansed skin. The scent & consistency is the usual toner one and contains 200ml of product. Even though this toner contains alcohol, it does not dry out the skin. It clears the skin really well and does not itch at all. It also soothes the skin after makeup cleansing as my skin is pretty sensitive and even routine makeup cleansing irritates my skin. This toner is in my favorite list for sure. SPECIALIZED MOISTURIZING CREAM against spots and blemishes • long-lasting mattifying effect • reduces pores visibility • soothes irritations delicate formula! instant action ZINC + FAST-MAT complex Pure Control SOS the specialized moisturizing cream, thanks to its innovative formula based on zinc and active sulfur prevents the development of germ, regulates the sebum secretion process and actively prevents the appearance of new spots. During the day and during night rest, the cream stimulates the proper functioning of the skin, leaving it fresh, matt and smoothened. The mattifying FAST-MAT complex absorbs excess sebum, reducing the visibility of blackheads and soothing irritations. Cucumber extract moisturizes and delicately brightens the skin, helps to fight with blemishes. Visible results: fresh and matt complexion all day long reduced visibility of spots, blackheads and blemishes noticeable reduction of irritations. This product comes in a squeeze-y tube with a lid. The consistency is creamy but a bit runny. The scent is mild but really refreshing and it contains 75ml of product which makes it airplane-travel-friendly. This cream has become my favorite when I am about to go for a full coverage makeup and I know it is going to get shiny really quickly because with my kind of oily T-zone, no primer works for over an hour or two. But this cream goes full matte and disappears upon application. Above that, it does not leave any white cast and is really light on the skin. If I wear this cream alone, without putting any makeup on top, it keep my skin matte for good 4-5 hours which is just unbelievable. Literally no cream has ever done that!!! I have never seen my nose matte for over an hour or two, no kidding. From my experience, I feel like once I start massaging the cream into my skin, it leaves a silky touch and feels like I have applied a really fine true translucent powder. Loving it! This is the part where I tell you if I have had any bad experience. Oh well, I wish there wasn't any but there we go. Since my skin is oily / combination, it is also pretty prone to black and white heads. And with all the humid, hot and haze-y weather in Malaysia, I get pretty good chance to get all the oil, dirt and God know what on my skin, every single day. And so, I love to try all the products designed for oily skin type. I used this routine, day & night, as instructed. On forth day, my nose and cheeks area was flacky and my T-zone [no the sides which have normal skin type ] was uneven. I thought it might be due to lack of exfoliation so I gave myself a facial and tried to remove the blackheads because I wasn't seeing any progress on my blackheads and thought that it might be a good idea to get rid of them first so the product would keep them away upon continues use. I was scared to see that even cleansing, massage and steam didn't open my pores on my nose enough to get those blackheads out. I was even more freaked out when I saw that my skin still felt flacky. I immediately stopped using this routine and switched back to my old routine using Eveline's White Prestige Day / Night Creams and Whitening Face Wash Gel. I gave myself two days to recover and kept my skin moisturized while also giving my brain to figure out what the heck just happened. What I figured was that these products are way more stronger for oily skin type. It did not irritate my normal skin area but dried the oily out of the T-zone. Then I went moderate; I used Pure Control Gel Wash just in the morning and used the Pure Control Moisturizing Cream while in the night, I use my other Whitening Face Wash Gel by Eveline and used White Prestige Night Creams to help my skin stay moisturized. I used toner about twice a week and also when I am wearing makeup during the day. Currently, my skin is baby soft, has a better texture, no breakouts and minimum blackheads which I managed to take out once my skin became moisturized after I switched to a different routine. I would not say that these products are a failure but I believe that every skin type will react to them differently and you just have to find a routine that suits your skin type. My current routine is keeping my skin itch, blemish and breakout free. As far as my T-zone is concerned, it stays less shiny so the routine I am following is working pretty good for me. These products are also really budget friendly but if you have oily skin type, better stay easy on the use and use them 2-3 times a day or however your skin would adjust to them. It is pretty normal for products which are designed to target oily-issues for the skin to sometimes dry the skin out or sometimes just oil the skin out just like the foundations made for oily skin type. Do let me know if you have tried this range, would love to hear your experience.